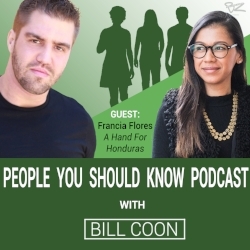 People You Should Know is a weekly podcast that will feature guests from a wide array of backgrounds. These people are either leading philanthropic organizations, raising awareness for a cause they are passionate about, inventing devices that will change the future, creating art or passionately dedicating their time to a unique hobby/subject matter. Guests of the podcast will share their stories, the inception of their mission/idea and their hope for the future of the industry, cause or topic in which they devote their lives. Are you a believer? Are you a nonbeliever? Regardless of which side of the fence you are on, this is the HALLOWEEN EPISODE! Bill is joined by Sage Etters, a woman with some tremendous stories. The two share their experiences with the paranormal and then discuss the science behind it. Are ghosts real? Or are they just a creation of the mind? The answer: Who Knows!? But this is a festive episode and you need to check it out now! Hypnagogic Hallucinations are experiences that may occur or are perceived to occur as the mind is transitioning to deep sleep. In this episode, Bill and Paula spread Congenital Heart Defect (CHD) awareness by breaking down certain terminologies into layman's terms to help the general public better understand the impact CHD's have on thousands of lives each year. The podcast also explores the work the Adult Congenital Heart Association (ACHA) is doing to strengthen the community of CHD survivors. Kevan Chandler was born with Spinal Muscular Atrophy, a neuromuscular disease which limits his mobility and requires Kevan to utilize a wheelchair. Wanting to visit parts of Europe that are not accessible (due to their nature of being historic locations), Kevan and his friends developed a plan to design a special backpack so that they could carry Kevan throughout parts of Europe, thus making the continent fully accessible. The trip later became the focus of a documentary, book and nonprofit organization. The nonprofit aims to inspire both the disabled and able-bodied communities to reimagine accessibility, then empower this change by providing resources and training for collaborative adventures. Born with a Congenital Heart Defect in 1967, Pete Mullady’s lifelong medical story has taken him and his family from Tennessee to Minnesota in search of the best medical care. Along the way, Pete was diagnosed with Protein Losing Enteropathy (PLE), which causes his body to leak valuable protein into his intestine. Pete shares his story, his takes on the medical field and the personal goals that keep him going. A condition that impacts the gastrointestinal tract (such as damage to the gut wall), which results in a net loss of protein. Imagine having a condition so rare that the top specialists are unable to diagnose you. In fact, after further research, they explain they need to name your condition after you. 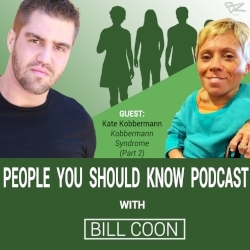 This is the story of Kate Kobbermann and her remarkable life with Kobbermann Syndrome. This episode is Part 1 of a 2 episode podcast. In this episode, Kate and her mother discuss the timeline of her life beginning with her birth and ending with the diagnosis of Kobbermann Syndrome. In the first-ever listener requested episode, Bill welcomes Erin Merryn, childhood sexual abuse survivor turned author, speaker, child advocate and activist. Erin is the founder and president of Erin’s Law, a law that has been credited for preventing dozens of child predators from harming countless children throughout the United States. Erin has been featured on The Oprah Winfrey Show, ABC Nightline, TODAY Show, TLC, and CNN, as well as many other popular programs and publications. The first U.S. child sexual abuse prevention education law requiring children be educated in school about identifying sexual abuse. Thus far, the law has been passed in 31 states with 17 additional states preparing to vote on the bill in 2017 or 2018. Judith Newman, author of the acclaimed book, To Siri With Love, joins Bill to discuss the inspiration for her latest book, her son Gus. Gus, who has Autism, developed a relationship with Siri, Apple’s automated assistant, who helped enhanced his communication skills and allowed him to strengthen his relationships with his family and the people around him. Judith also discusses her life and how she balances a successful writing career with being a mother. To Siri with Love is a collection of funny, poignant, and uplifting stories about living with an extraordinary child who has helped a parent see and experience the world differently. From the charming (Gus weeping with sympathy over the buses that would lie unused while the bus drivers were on strike) to the painful (paying $22,000 for a behaviorist in Manhattan to teach Gus to use a urinal) to the humorous (Gus’s insistence on getting naked during all meals, whether at home or not, because he does not want to get his clothes dirty) to the profound (how an automated "assistant" helped a boy learn how to communicate with the rest of the world), the stories in To Siri with Love open our eyes to the magic and challenges of a life beyond the ordinary. After beating cancer, Jonny Imerman realized there needed to be a network for cancer fighters to connect with cancer survivors, so he founded Imerman Angels. Jonny and Bill discuss the creation of Imerman Angels, the speed in which the foundation has grown, and then Jonny provides current cancer fighters with a word of advice. Imerman Angels provides free, personalized, one-on-one cancer support for cancer fighters, survivors and caregivers across the globe. To learn more, visit imermanangels.org. Two sisters. Same condition. Both blind. Both Julie and Cheryl Gistenson lost their vision due to Axenfeld-Rieger Syndrome. The sisters discuss growing up as one another's supports and what they learned from their father, who is also blind. Bill and the sisters then play a game called "Ask A Blind Person" in which Bill asks questions about blindness that sighted individuals may feel too uncomfortable to ask. ARS is a condition that causes abnormalities within the eye, particularly in the frontal region near the pupil. Individuals impacted by ARS tend to develop Glaucoma, a condition that creates pressure and subsequent pain behind the eye. In 2013, after undergoing months of fertility treatment, Stacey Skrysak’s three children, Peyton, Parker and Abby, were born prematurely. Tragically, both Parker and Abby passed away in the hospital. After returning home with their surviving triplet, Stacey and her husband, Ryan, created the Triple Heart Foundation to honor the memory of Abby and Parker. Bill and Stacey discuss her journey with infertility treatment, the day she delivered her children and the families Triple Heart Foundation has touched since its inception. Triple Heart Foundations sends care packages and books to families in Nicu nurseries who find themselves in a similar situation as Stacey and Ryan. The hope is to provide not only support, but books for parents to read to their children. Natalie was diagnosed with Crohn’s Disease in July 2005. After several hospitalizations, countless medications and flare ups she underwent her first surgery in August 2015. Since recovering from the surgery, Natalie has become an advocate for Crohn's patients via her blog, Lights, Camera, Crohn's: An Unobstructed View, where she provides readers with weekly insight about what life is like living with a chronic, invisible disease. Crohn's Disease is a category of Inflammatory Bowel Disease (IBD). Individuals with the condition experience chronic inflammation of their gastrointestinal tract, which results in abdominal pain, fever, and loss of appetite, among many other life-altering symptoms. In 2014, after backpacking in Sri Lanka, Janey Lowes learned of a large population of dogs living in poor health and under terrible conditions on the island. Being a trained veterinarian, she returned home to the United Kingdom, where she formed the nonprofit organization, WECare Worldwide. She returned to the island shortly thereafter and has made it her life’s mission to care for the dogs in Sri Lanka. WECare Worldwide is an organization that provides free veterinary care to animals in need worldwide. Ultimately, WECare Worldwide plans to extend veterinary services around the globe but, right now, they are concentrating on tackling the issues with the street dog population in Sri Lanka. It is estimated that there are up to 3 million street dogs in Sri Lanka. WECare Worldwide is in the process of carrying out a 5 year plan, in which they will look to help eliminate rabies in the country and also humanely reduce the number of unwanted street dogs. This week's guest is Jay Austin. Bill and Jay discuss the Minimalist lifestyle, how he purged much of what he owned, moved into a tiny house and how he is now living off the grid for the next several years! Jay is currently biking around the world with his girlfriend as he strives to achieve a life of Minimalism and happiness. Minimalism is a lifestyle in which an individual removes unnecessary items from their life in an attempt to better themselves and focus on what truly matters to them. The debut episode of People You Should Know Podcast! Bill describes the vision for the podcast and then speaks with Megan King, who shares her experiences as an individual with Ehlers-Danlos Syndrome (EDS).